Whirlwind Lodge: I'm so sorry. Really I am. I'm so sorry. Really I am. Yesterday, I picked up a package from the post office which we had missed when the mail lady came to our door. We didn't recognize the name of the sender, and our last name was spelled wrong (which isn't that unusual...many people try to "French it up" just a tad, so their mispronunciations can be justified). Anyway, when I got the package, I immediately recognized the company it came from, but daggumit if Big Boss Man hadn't been the one to order, and I felt bad opening his envelope...so I wwaited until he got home from work way late last night. He opened it, and although I had to roll my eyes just to keep up appearances, inside I was smiling like crazy about what he bought. 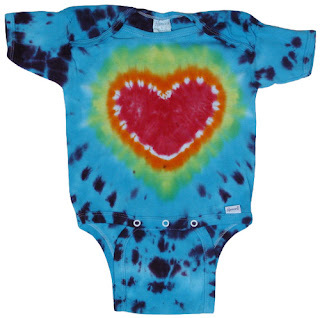 It's a Grateful Dead onesie!!! Seriously...how absolutely adorable is that?!?!? The one sent is just a tad different...more rainbowy instead of blue, but it's the heart design. Of course, he said that's what LMJM will wear home from the hospital, and I had to put the kabbash on that idea. But I'm sure she'll wear the dickens out of it once we get her home! Great minds think alike. Being a tie dye freak myself, I was thinking along the same lines. Glad Daddy beat me to it. I'll put my bid in now for seeing LMJM within the first month of her life cause I know the line will be long...take care and call if you need anything. Can I single someone out?